Those were the panicked words out of the mouth of one of Jeremiah and Audrey Johnston’s five children, when told they have to evacuate their shelter. They live 2 miles from the Brazos River in Texas, which was at an all-time high due to the torrential rains of Hurricane Harvey. CLICK HERE to watch their story in this short video. … For those impacted by the epic destruction caused by Hurricane Harvey. You may have heard and seen often on TV and Facebook, commentary saying the devastation is of biblical proportions. The untold suffering by those displaced by flood waters, by those who are soaked head to foot, who have no change of clothing or food to eat or water to drink is so sad and devastating. Harvey may wind up being the costliest natural disaster in America’s history, considering the population size of the area. It has already dumped 52 inches of rain in Texas, breaking the continental U.S. record. He may as well been talking about Hurricane Harvey. It is a huge American crisis. This is where good people, churches, charitable groups and Christians come together to aid those in the devastated regions. President Trump and FEMA have responded to the crisis, noting that “Texas has never seen an event like this.” But there is only so much ground the government agencies can cover. Much of the one-on-one, hand-in-hand work comes from the “independent sector” – men and women helping one another. This is where Samaritan’s Purse, the Salvation Army and other Christian groups, and churches have rolled up their sleeves and went to work in Texas. Yes, these are times where stranger helps stranger escape the flood waters. When it pours like this, we are all one. No doctrinal differences. No skin color. No politics. And that is how Christians reaching out in love are acting. The highly ranked Samaritan’s Purse (it scores 96 out of 100 on Charity Navigator, including 100% on accountability and transparency) provides not only spiritual aid, but physical aid to those affected by disaster around the world. Samaritan’s Purse President Franklin Graham has deployed 5 disaster relief units to southeastern Texas. These are tractor trailers stocked with emergency relief equipment, supplies, staff and volunteers. (CLICK HERE to see how Samaritan’s Purse is helping). “We want to help these people who have lost their homes, sometimes everything, in the name of Jesus Christ to put their lives back together again,” said Graham. Small churches and megachurches like Joel Osteen’s Lakewood Church, are receiving people who need shelter and also helping evacuees with supplies such as baby food, formula and other shelter needs. Tony Perkins’ church in Louisiana is organizing relief to take to Texas. Food, clean up supplies, water is on the way. His Family Research Council works with a network of 15,000 pastors, who have been alerted to immediate needs. Donate relief packages through the Red Cross and other agencies. Donate to Samaritan’s Purse by CLICKING HERE. Harvey is the biggest hurricane to hit the U.S. in the last 12 years. The last time a Category 4 hurricane hit Texas was 1961. 50 inches of rain in the Houston area, a record-breaking 52 inches in Texas. 56,000 911 calls in a 24-hour period. 3,400 water rescues in Houston alone. 13 million people are under flood watches from Corpus Christi to New Orleans. Recovery efforts may take years. Many rivers are projected to crest 10 feet above previous record levels. Houston is the heart of the U.S. energy sector. Lost jobs and lost wages will be astronomical. What we are watching unfold is the best of America in the worst of times. As I went from channel to channel, be it Fox, MSNBC or CNN, people were testifying to their faith. Whether reports were on TV, radio or newspapers, God’s love was being professed to by survivors, rescuers and even city mayors. For those who believe God abandoned us since our fall into sin, I point to three faith-affirming reasons why He has not. Jesus died on the cross for our sins, paying the price to redeem us in full. God promises us, “When you pass through the waters, I will be with you” (Isaiah 43:2). His word assures us, “There is nothing in all creation that will ever be able to separate us from the love of God, which is ours through Christ Jesus our Lord” (Romans 8:39). The Bible, in Luke 19:41, says Jesus wept over Jerusalem. I believe He is weeping over Houston and the Gulf Coast today. Tony Perkins of the Family Research Council discusses relief efforts on behalf of his church in Greenwell Springs, La. CLICK HERE to watch. Watch this beautiful tribute to Jesus in this 3-minute video as a woman breaks out in song at a Texas shelter. 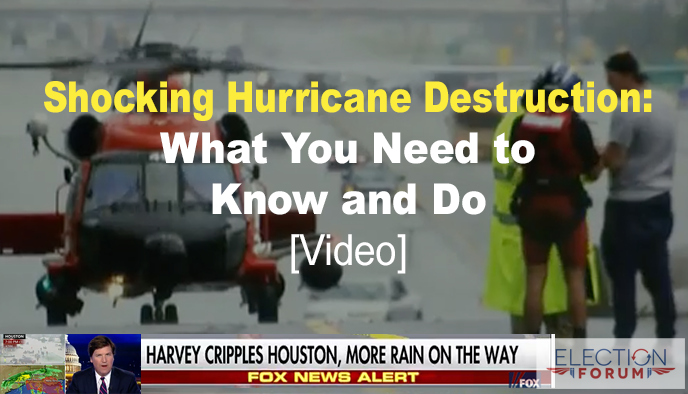 Watch this powerful 7-minute video overview of Hurricane Harvey’s destruction.